The desert rose (Adenium obesum) is a striking plant with succulent stems and deep red flowers. The plant is deciduous in cooler winters, but it can be kept in leaf provided there is sufficient warmth and light water. Every part of these plants commands interest, from the dramatically swollen stems on older plants to the bright flowers to the tight clusters of narrow, green leaves. There is an important consideration when growing this plant, particularly in the house: its sap is poisonous and should never come into contact with children or pets. If you get sap on yourself while handling the plant, wash your hands immediately. Propagation is typically by seed. If your plant develops a seed pod, plant the seeds as soon as possible after the pod ripens, to maximize the chance of germination. The fresher the seeds, the better. If you don't have a mature plant for harvesting seeds, ask your seed supplier about freshness before buying. Some gardeners use a heat source to keep the containers at 80 F to 85 F; otherwise, they should be kept as close as possible to that temperature range. Once the seeds germinate, the plants should be ready for moving to a pot in about a month. The desert rose can be propagated from branch cuttings, but the plants often fail to develop the characteristic (and highly desired) bulbous stem. 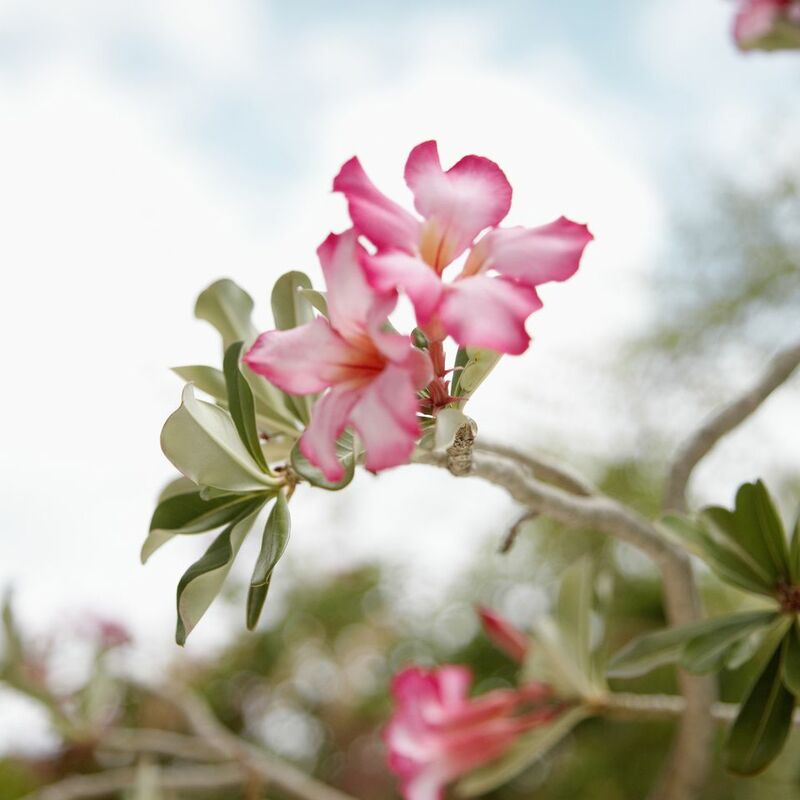 Adenium belongs to the genera Apocynaceae, which is native to Africa, the Middle East, and Madagascar. The desert rose (A. obesum) is the only Adenium found in wide cultivation, although it has been hybridized extensively to obtain different flower colors, including orange, white, striped and the traditional red. These are not difficult plants to grow well, provided they get enough sunlight and warmth. Like all succulents, they cannot tolerate sitting in water, and if you err, do it on the side of too little water. Use a specialized soil mix designed for succulents and cacti.